In 2016, the York County Food Bank debuted an Iron Chef-style competition with the goal for the chefs involved to showcase that the food given out at the bank. Organizers wanted to show that the items offered at the bank were more than just unwanted food — that a great meal could be crafted from those ingredients with just a bit of time and effort. As last year’s event began to wind down, Matthew Shorb, chairman of the York County Food Bank, already had participants asking about the next competition. The event was more than a hit with participants, it was a big boost for the food bank. This year, the food bank’s flagship event is back. Two of the chefs, George Sheffer from Victor’s Italian Restaurant and Gregory Mummert from Country Club of York, have returned and will face off against first time participants Taylor Davis from Tutoni’s and Abby Shelley from Rockfish Public House. The competition is loosely based off the “Iron Chef” television shows in Japan and America where chefs challenge each other to create the best dishes in a timed cook-off around an ingredient or theme. Like last year’s event, the chefs at this event will prepare three meals — an appetizer, an entrée and a dessert — using foods commonly given out at the food bank. Davis was born in Southern California, but raised in Shrewsbury. Over the past few years, he spent time with Loxley’s in Lancaster County and the former Maewyn’s in York before helping to open Tutoni’s. He takes pride in Tutoni’s farm-to-table concept, and the restaurant’s house-made pasta has always been the focus of his attention. Mummert returns to the competition in 2017 after competing in 2016. A long-time food industry vet, Mummert worked his way up the restaurant industry ladder from being a dishwasher at the country club in 1981 to becoming its executive chef. Like Mummert, Sheffer is returning to the competition after participating in 2016. 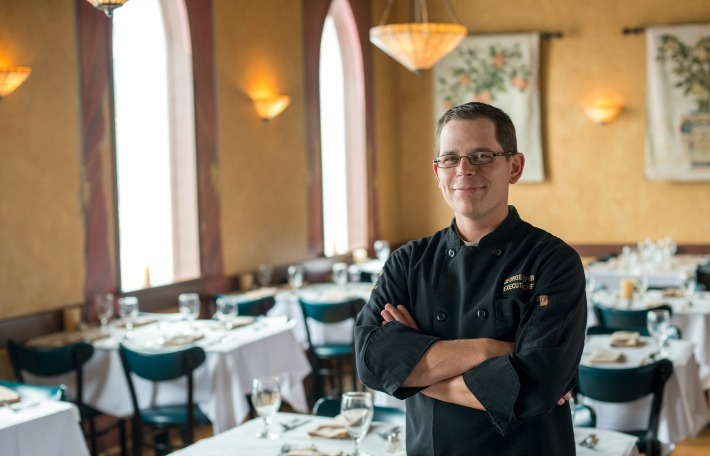 In his time as executive chef, the restaurant has garnered several awards including “Best of York” and the Susquehanna Style Silver Spoon Awards. Shelley may be a rookie in this competition, but the Drexel alum has plenty of experience in the industry. Over her 18-year career, she honed her skills as a sous chef at the White Rose Bar and Grill until she became the executive chef at Rockfish Public House when the restaurant opened in 2016. The food bank is a central serving hub that collects food from various sources, then redistributes them to over 125 agencies throughout the area. The food bank provides about 2 million pounds of food and household items annually, the agency mission states. Monetary donations to the food bank, which help pay for food handling, transportation, extra food goods, utilities and more, can be mailed to the food bank’s distribution center at 254 W. Princess St., York PA 17401 or be made online at yorkfoodbank.org/give-help/donate. Food donations can be dropped off at the food bank’s distribution center between 8 a.m. and 3 p.m. Monday thru Friday. When: Oct. 23 at 5:30 p.m.